Peverini and Robert Kindya, the coordinator of assistive technology. 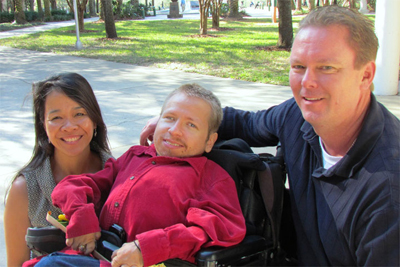 TAMPA, Fla. -- When Christopher Lehman rolls across the stage on Friday to accept his newly-minted Bachelor of Arts in Psychology from the University of South Florida, he will be capping a journey 31 years in the making for him and his family. Born with juvenile rheumatoid arthritis which requires him to use a wheelchair, Lehman also has endured the loss of his eyesight as a side effect of the medications he must take. But with the support of his parents and USF’s Students with Disabilities Services and professors who supported his academic journey, Lehman has achieved a remarkable 3.9 grade point average that would be the envy of many students. His collegiate journey took 13 years -- seven at St. Petersburg College and six at USF -- but the degree he’s long sought is now his. Now considering a future in counseling others with disabilities or working with wounded war veterans, Lehman, 36, reflected on the long road to graduation -- one his family and friends said he traveled with an upbeat attitude, good humor and a healthy dose of stubborn determination. His parents, Rick and Carol Lehman, say they too have been astounded by their son’s sheer determination to complete his degree no matter the obstacles in his way. Rick Lehman is an alumnus of USF’s Class of 1969 and the first captain of the then-fledgling university’s golf team. As parents seeking the best education for their child in an era when schools were often ill-equipped to accommodate people with disabilities, the Lehmans acknowledge they’ve had their share of battles to make sure Christopher was provided the same educational opportunities as all other children. But their story is also full of triumphant and thankful moments -- to teachers who early on recognized their son’s keen intellect and challenged him; to school districts that provided teachers who came to their home to teach him one-on-one; and to USF’s Students with Disabilities Services, which made finishing his degree possible. “You have to have a strong support group, and I do,” Lehman said. Imagine not only navigating campus in a wheelchair to get to your classes, but not being able to see the blackboard or the words on the pages of books once you got there. In math classes, Lehman would have to listen intently to the professor describing the algorithm because he couldn’t see the work done on the board. His solution: memorize the formulas to get his work done. At USF, Lehman’s text books and exams had to be converted from printed paper to digital audio files -- a process that required every page to be scanned, digitized and then processed by an audio reader. That task was taken on by SDS Coordinator Robert Kindya, who estimates he scanned some 20,000 pages just for Lehman. But ultimately, the learning was all in Lehman’s hands. His approach to his school work was slow and steady. “I can’t tell you how many times he’s been up until 1 or 2 a.m. after starting at 10 a.m. working on a project that would take someone else three or four hours,” Carol Lehman said. “I don’t know how he does it. But if it’s been a struggle, Lehman doesn’t show it. A talented writer with the quick wit of a standup comedian, he includes in his college memories USF football games (he couldn’t see the plays, but he enjoyed the sounds of the crowd) and the enjoyment of being on campus and interacting with new people. He still remembers in his first year at USF being invited to a lunch with President Judy Genshaft and bluntly being asked: “What can we do better?” Lehman advised the president that it wasn’t much fun navigating his metal wheelchair through parking lots during lightning storms and covered drop-off zones at buildings would be greatly appreciated. But as much as he’s enjoyed USF, don’t even ask about graduate school.